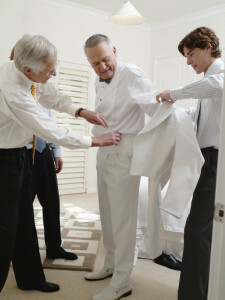 Preparing to appear at the grandest celebration of his life. Your 15 minutes have arrived. Roll out the red carpet. A living funeral is the grandest celebration of your life with a twist—you, the honoree, are living and present to hear the eulogies, praises and farewells given before death. This gathering of family, friends, neighbors and colleagues is a ceremony or party to celebrate a person with a life-limiting illness. If you know your time is short why wait? In researching my book Parting Ways, I’ve come to realize that these pre-death rituals that seem rare are on the rise from the east to west coasts. People are toasting and roasting family members and friends with limited time left. Some look like a cross between a wedding and funeral. These formal or informal get-togethers take place at a home, community center, house of worship, hotel banquet hall, a favorite restaurant, a theater, or any place that would honor the person. I’ve seen the honoree dressed in everything from a hospital gown to a tuxedo. Others are more somber with collective prayers, Psalms or Holy book readings, anointing and last rites given by clergy. As I mention in my column about a living tribute in the OC Register, “The gathering becomes a stage for people to share memories, sometimes songs, poems and lifetime achievement awards that express: thank you, I love you, I’ll remember you. And goodbye. The funeral in living funeral tends to put people off because they feel like they’re digging the grave too early, but quite the contrary gathering to eulogize and celebrate one’s life before he or she dies is the antithesis. These pre-death ceremonial farewells have been coined living wake, celebration of life, friendship service, living tribute, reminiscing party and sendoff. No matter what these personalized rituals are called the most important element is that a special time is carved out for intimates to express love, gratitude and those things we should’ve, would’ve, or could’ve, said if we found the right time. on the New York Times Best Seller List. Morrie Schwartz, dying of Lou Gehrig’s disease, goes to a funeral and realizes that his late friend didn’t get to hear all of the wonderful speeches so he decides to have a funeral before his death. He invited his family and friends to come to his home and say the things they would’ve said at his funeral. At Morrie’s living funeral in the Emmy winning made for TV movie produced by Oprah Winfrey, gospel singers perform giving the home ceremony a reverence that it so deserves. because more people are taking their end of life journeys in the comforts of home, family and community rather than estranged in a sterile institution. Sometimes, people don’t learn the most interesting attributes and experiences about a person until the funeral. So, the living funeral offers a time to really learn about the “whole life” of a person. Today, people lead such splintered lives spread far apart in many cases from their birthplace and their families. It takes a death to unite people from distant locals in one place. A living funeral maybe the last time a person joins with all those he or she loved and experienced life with and vice versa. When I interviewed John Hogan, former president of the National Funeral Directors Association, for my book, Parting Ways, he recalled a man dying of cancer, who asked to have a living wake in the viewing room of his New York City funeral home. Friends and family came to the funeral home viewing room to collectively reminisce and the dying man sat on a throne like a king relishing every last moment shared with his beloved court, instead of laying dead in a casket. So when might a person chose to indulge in such a ritual? Today, most people know when their time is short and the body is in irreparable decline. Many people deny it to themselves and those around them for self-preservation and protection of the family. The living funeral, also known as a celebration of life or living wake, is so instrumental in stimulating the family and friends to begin to talk about the possibility of the end. It’s not talking about death but rather life. I’ve come to the conclusion that a living funeral or living wake honors a person in a way that no milestone or birthday celebration is able to over the course of a life. In those culminating hours, family, friends and colleagues mark the sum of all those milestones and birthdays, a total life mission accomplished. A terminal illness strips a person of his or her autonomy, individuality and social identity. Experts often call this a social death because a person maybe bound to a wheelchair or a bed. This consequence makes a person feel like a half-human. This is the hour when a person feeling quite vulnerable could find renewal in hearing about his or her life shared through the cherished lens of others rather than after he or she takes the last breath. The ritual binds the honoree, family and friends in reciprocity. Everyone is uplifted in a way they thought impossible at this stage of life, because attendees are given the microphone to say those words of remembrance and know the honoree is receiving it. That is so gratifying especially at an hour when we as humans feel completely out of control. They call the end of life awful. When people gather for collective reminiscence everyone is awe-inspired. A good ritual shatters isolation and leads the way to transformation. In the end, it’s a remarkable gift to give as a parting gift to the honoree and an extraordinary memory to leave in the minds of survivors. What a helpful post you’ve written! I am curious, are you seeing a local trend of more Living Wakes occurring? If so, who is assisting a family with organizing and leading them? I am a Life-Cycle Celebrant® based in Tucson, Arizona and I specialize in heart-crafted ceremonies for end-of-life issues. I am building more life celebration services into my practice and would love to learn more about what you are experiencing! So happy to connect with you. I’m thrilled to hear you are interested in living funerals and living wakes. Since I’ve been researching living funerals over the last five years while writing my recently released book Parting Ways: New Rituals and Celebrations of Life’s Passing, I’ve seen an upward trend nationally and locally. In fact, I just attended one last week for a neighbor. It was planned by a few friends in the neighborhood. I look forward to hearing how you are helping families in your local community celebrate life. Please keep us posted!! I contracted Cancer about five years ago and as yet do not show many outward symptoms, apart from those associated with the on-going treatment. I have been made aware that I should not count on many more birthdays, but I feel privileged to have the time left to organise my family and my affairs. I am also a Palliative care volunteer here in Canberra Australia and cherish the time that I am able to spend with residents at the local Hospice and in the community. As part of my volunteer work I occasionally attend funeral services for those with whom I have had contact and I am always surprised at the number of people who turn up to the service or the following Wake. I think it’s a pity that the individual has not had the opportunity for a last farewell with friends and acquaintances. (don’t want to scare them off with the name) while I am still able to appreciate it. I’m hoping that I will get more than three or four attendees and that at least one of them will say something nice about me. While I personally think this is a great idea, I’m hoping that the attendees will not feel too uncomfortable. Only one way to find out. I toast you for having a clear-eyed approach to your life in the shadow of cancer. You must have so much strength and courage to volunteer even in your vulnerable hours of life. I too agree that it’s a pity to see such amazing tributes at a funeral and wish that the honoree could hear all of these wonderful ways he or she has touched so many. As far as your “Transition Party”, I say my hat is off to you, no time like the present to gather with friends and family to celebrate your life. It doesn’t have to be uncomfortable. I would love for you to read chapter 2 of my book Parting Ways. It’s called Living Funeral: Celebrating the End of Life. I think that you will find that Marty Geltman, who was also battling cancer, found a way to have as you call it a “Transition Party” that brought all of his friends and family together to toast and roast him. He wore a tuxedo to the celebration attended 150 intimates at a church. In the book, he plans the whole affair. I would be happy to send you a copy of my book for inspiration on your journey. I would be happy to send you a copy of my book for inspiration on your journey. Please keep me posted. I was diagnosed with ALS last November. I’ve only now begun to process the imminence of my death. I’ve been having a lot of good cries in the last several days, not because of death but because the process of dying this way is really scary and demoralizing. I’ve been the care taker all my life and now I am the one who is requiring more and more care. I don’t want to leave a.houseful of crap for my son to deal with when I die, but getting rid of or just putting things in storage that are.too heavy or cumbersome is making me feel like i’m giving/throwing away myself in little pieces. It hurts and it’s hard and it’s something not many people understand. I want to have a living funeral to help me tell my family and friends how much I love them. I want people to be able to tell me things that they have been wanting to tell me. I want them to be able to vent their anger at fate in a supportive place. I just want to see all the people who would be coming to my funeral before I die. I just want to toast your wide-eyed walk into the life’s final frontier. You have so much courage in the face of dying. Instead of throwing all of these personal mementos that you’ve collected over your life journey. You may want to find the ones that mean the most to you and figure out the person in your family or community of friends to bequeath these mementos that hold the stories of your life. Also, in Chapter 4 of my book Parting Ways, I share the story of a woman Mary Dexter who I think you would really relate to. I’m happy to send you a copy. Finally, I encourage you to send an email out to your friends and family to invite them to your living funeral. In the email, ask them to bring a story about you or a photo/memento from a time they want to reminisce with you about. At the gathering, you can give the personal mementos you found in cleaning out your home and share your life stories attached to them. Also, if you want a way to vent your anger, give everyone a sheet of paper at the gathering. They write down what they’re angry about. Then each person shares it. At the end of the sharing you find a way to release these pieces of anger by burying or burning them. I think that in your darkness, you will be able to share and release the anger, the sadness, the fear and ultimately discover the unexpected joy of being able to come together on this journey. Further to my last post on Jan 26, I attended the get-together (Transition Party) for Colin in Mudgee and it was gratifying to see the number of people who turned up for the event. Colin really enjoyed the time together with good friends. As you would imagine he and I compared scars so to speak, having a good chat about how we got to this position, what is currently happening to us and what we can expect in the future. I think the ability to talk about these things was beneficial to both of us. A number of people said very nice things about Colin, who in turn reminded them that I was in the same position just tagging along behind. We had a good talk about the next step, Chemo, and Colin mentioned that he was not going to follow it up. Denise, I may have mentioned to you that I am a Palliative Care volunteer working in the community and at the Canberra Hospice (Clare Holland House) and I mentioned to Colin that from what I have seen as a volunteer, Chemo affects everybody differently, and when it comes my turn I think I will try a cycle and then make the decision as to continuing or not. I think this may have given Colin something to think about with his own situation. The weekend took a lot out of Colin, as you would expect and since then we keep pretty well in touch, we have decided to use each other as sounding boards when things turn to ##**# throughout this process. Although I can’t solve his problem, at least I can lend a sympathetic ear. I am sold on the idea of getting together before the final event and the trip to Colin’s wake gave all his friends a chance to say goodbye while Colin was still in a position to travel. I am honored that you both are sharing your stories, plans and hopes, with our readers. I am touched by your raw honesty and authenticity as you approach this part of your lives. I am inspired by your courage. Norma, I agree with Denise’s suggestion regarding ideas to bestow your belongings to your friends and loved ones. There is healing in your belongings, both to you as the giver, and to those who care for and love you. The article that Denise shared with you, “Cleaning Out My Mother’s Closet” is my most cherished article written by Denise, as it represents the opportunity to use your belongings to create a space for reminiscing and life review. The stories that are shared through this process are one way we live on. I would love to do this for my mother who will be 82 this year. We held a celebration for her 80th birthday and that was great. Since then, her memory is getting worse and with alheimers , things won’t get better. I would love to do this for her now, while she can remember all the beautiful things that everyone will have to say. One hurdle that I’m sure I have to clear is my family. Not my children, but my brother, aunts andd uncles. They can be very negative when it comes to anything unconventional. Yet I will try to make this the best celebration of life that I can for my Mom. Hi Denise – I appreciate it’s been a while since this thread was started (and finished) but I’ve just come upon it as a result of a stray thought leading to a casual web search. I’m not facing, and neither is anyone in my circle, the prospect of imminent demise (touch wood…) right now. I was wondering if your researches had produced any examples of people who were actually opposed to the idea of normal funerals, and who issued “now or never” type invites to living services? I rather like the idea myself, although I appreciate that many may be reluctant to deny their nearest and dearest one last opportunity to remember and mourn in their absence.